Jason, Fred, and Silicon Valley VCs, I’ve got news for you: you’ve got it all wrong. Entrepreneurs aren’t born, they’re made. And they aren’t anything like you think they are. My team surveyed 549 successful entrepreneurs. 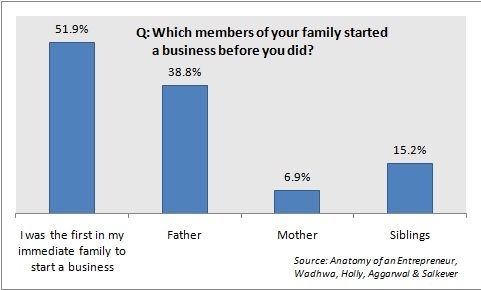 We found that the majority didn’t have entrepreneurial parents. They didn’t even have entrepreneurial aspirations while going to school. They simply got tired of working for others, had a great idea they wanted to commercialize, or woke up one day with an urgent desire to build wealth before they retired. So they took the big leap. Only a quarter caught the entrepreneurial bug when in college. 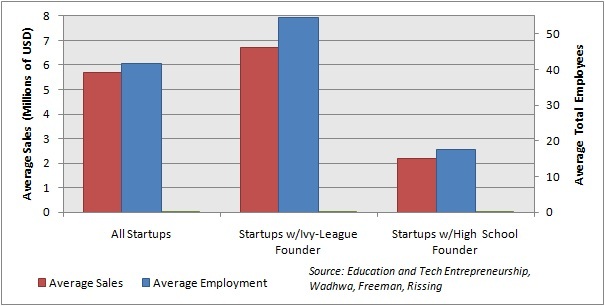 Half didn’t even think about entrepreneurship, and they had little interest in it when in school. There was no significant difference between the success factors or hurdles faced by entrepreneurs who were extremely interested in entrepreneurship in school (and who likely set up the lemonade stands) and the ones who lacked interest. But entrepreneurs with extreme interest started more companies and did it sooner. Of the 24.5% who indicated that they were “extremely interested” in becoming entrepreneurs during college, 47.1% went on to start more than two companies (as compared with 32.9% of the overall sample). Sixty-nine percent started their companies within 10 years of working for someone else (as compared to 46.8% of the rest of the sample population). What did affect their successes? Education — but not the college they graduate from. In a different study of the 652 CEOs and CTOs of 502 tech companies, we researched the correlation between education and the sales and headcount of companies founded. We learned that the there was a significant difference between companies started by founders with just high-school diplomas and the rest. Education provided a huge advantage. But there wasn’t a big difference between firms founded by Ivy-league graduates and the graduates of other universities. The education and training of entrepreneurs is something that the Kauffman Foundation has been researching extensively. Over the last six years, it has invested around $50 million on academic research to understand what makes entrepreneurs tick and what policies are most conducive to entrepreneurship and to construct data bases to permit analyses of these subjects. (Kauffman has also funded some of my research at Duke, UC-Berkeley, and Harvard.) Its VP of Research, Bob Litan, says that Kauffman has learnt conclusively that entrepreneurship can be taught. The key is to provide education at “teachable moments” — when the entrepreneur is thinking about starting a venture or ready to scale it. What entrepreneurs need isn’t the type of abstract course they teach in business schools, but practical, relevant knowledge. That’s why Kauffman created a program called Fast Trac, which has trained 300,000 entrepreneurs so far. One of the findings of Kauffman research is that of the appx. 600,000 businesses that are started every year, less than a fraction of 1% become high-growth “scale” businesses. These new firms, especially the “scale” firms, have added all of the net incremental jobs to U.S. economy since 1980 (about 40 million), and probably account for about 1/3 of GDP growth since then. So the key to boosting economic growth is to increase the number of successful high-growth startups. After all, the growth rate of our economy is nothing more than the aggregation of the growth of our firms. That is why Kauffman (which has a $2 billion endowment) is investing heavily in an ambitious new program called Kauffman Labs. This aims to dramatically increase the ability of small businesses to become big businesses. The Labs program is built around a novel idea: that highly motivated individuals with “scalable ideas” can be recruited to be entrepreneurs and to be made successful, by surrounding them with a network of other experienced entrepreneurs; sources of money; and mentors. The goal is to educate entrepreneurs and surround them with a powerful network. This is like a Y Combinator on steroids. Anecdotal evidence also shows that there are many more factors at play than that of genes. Note this BusinessWeek article about waves of spinoffs from Google. I doubt that all of these Google employees who are starting successful businesses were born with entrepreneurial genes. VC and former entrepreneur Brad Feld also blogged about how many of his frat buddies at MIT had become successful entrepreneurs. Were all of these people born to be entrepreneurs as well? I don’t think so. It is probably education, exposure to entrepreneurship, and networks that led these people to pursue the entrepreneurial path — which means that Kauffman Foundation may have hit on the right idea with Kauffman Labs. The reason this topic is really important is that, as Wilson writes, “Venture Capital is a lot about pattern recognition”. The reality is that VCs like him make quick judgments about people based on the stereotypes in their minds. So, like the women that I wrote about in my previous posts, we may be disadvantaging another important segment of our population – a segment that is older, more humble, more sensible, and more realistic than the population that is getting all the attention (and the money).